Finest Saint Lucia rum. Handcrafted blend. Triple distilled pot. Aged in oak. Original created by Laurie Barnard. Rum with natural flavors and caramel color.Spirit Drink Rum Chairman's Reserve Spiced begins with a handcrafted blend of aged rums. 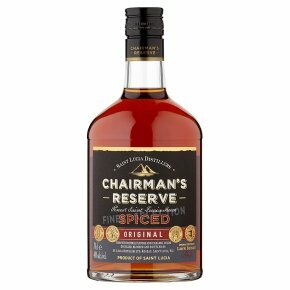 This rum is used to steep Caribbean fruits, bark and spices and contains cinnamon, vanilla, nutmeg, clove, bitter orange and other natural ingredients to give a glorious and authentic Saint Lucian Spiced Rum experience.